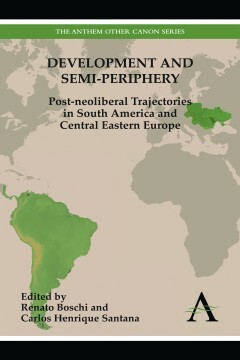 This book is a collection of articles focusing on comparative analysis of the development trajectories in the semi-periphery countries of South America and Central and Eastern Europe. This book is a collection of articles focusing on comparative analysis of the development trajectories in the semi-periphery countries of South America and Central and Eastern Europe. The book tries to approach the dilemmas of development in the semi-periphery as diversely as possible, always emphasising the variety of trajectories as a crucial factor. Therefore there are evaluations of the role of cognitive regimes produced by professional fields as elements of collective action coordination and as beacons that fix State-society relations. As opposed to the transitology studies that were prevalent in the 1990s, and that treated the neoliberal context in these two regions separately, the articles in this volume instead offer a new comparative analysis about the consequences of the neoliberal reforms and the new actors that deal with these results. The book is concentrated on the experiences with market reforms and institutional legacies during the last twenty years. Central and Eastern Europe and South American countries have gone through a rapid restructuring of productive regimes in the process of integration with the global capitalist system. This volume discusses the variety of forms of state that have unfolded in different peripheral countries and their role in the social engineering of economic models and social policies, as well as to the impact of state capacities and ideas on the institutional innovations. These essays also compare the transformations in political culture, collective identities and contentious politics in both areas. The growing distance between the state and society, social disintegration and the concrete effects of market reforms (unemployment, informality, loss of rights) were closely related to a growing social mobilization as well as to a politicization of social and ethnic identities in South America. In Eastern Europe the institutional model of liberal democracy has been challenged on the one hand by the claims of social equality that derives from the communist legacy, and on the other hand by the question of political rights that has emerged within the context of the new wave of nationalisms and politicisation of ethnic identities. Renato Boschi holds a PhD in political science from the University of Michigan, and is currently Full Professor in Political Science at the Institute of Social and Political Studies, IESP-UERJ. Carlos Henrique Santana holds a PhD in political science from the Institute of Social and Political Studies, IESP-UERJ, was formerly Assistant Professor in Political Science at the Federal University of Rio de Janeiro (UFRJ), and is currently a researcher at the International Celso Furtado Center for Development Policies and at the NEIC-IESP.